For the 446-pound patient in New Mexico, having a heart attack wasn’t the worst thing that happened last April. Even more harrowing was being turned down by the air ambulance that came to the rescue -- because the victim was too big to get off the ground. Increasingly, America’s growing girth is grounding patients who need emergency help by air, say Yale and other operators. An estimated 5,000 super-sized patients a year – or about 1 percent of more than 500,000 medical air flights annually in the U.S. – are denied transport because they exceed weight and size limits or because they can’t fit through the aircraft doors. Experts say the nation’s plus-size proportions – at least two-thirds of adults are overweight or obese – are now forcing emergency medical providers to bolster their fleets, buying bigger helicopters and fixed-wing planes, or risk leaving critically ill and injured clients behind. Just this spring alone, records show that at least three other Air Methods patients were declined, including a 460-pound Texas victim who couldn’t breathe, a 444-pound Arizona patient with severe abscesses and cellulitis and a 225-pound Arizona patient who had an infection caused by flesh-eating bacteria and couldn't be transported by a responding helicopter. In such cases, the next option is to go by ground ambulance, which can take twice as long – often in situations where every second counts. A 2011 study in the journal of Academic Emergency Medicine found that patients transported by medical helicopter were a third less likely to die than those who went by ground. “Clearly, someone who’s bleeding or someone where you can’t control the bleeding, they’ve got to get there,” said Dr. David Thomson, a professor of emergency medicine at the Brody School of Medicine at East Carolina University and a board member with the Association of Air Medical Services. If air transport isn’t possible, the highly trained crews who staff the flights will jump in the ground ambulances to ensure that top-notch critical care continues. Turning away hefty patients isn’t a regular occurrence, but it happens often enough that flight crews keep measuring tools handy just in case, Thomson said. Size limits for patients can vary widely depending on the medical transport operators, the types of aircraft, even the day’s weather. At Airlift Northwest near Seattle, crews start to worry about any patient who is heavier than 250 pounds and wider than 26 inches across, said Brenda Nelson, the firm’s chief flight nurse. But other transport firms routinely handle patients who weigh 350 or 400 pounds, or more. At the Duke University Health System, officials with the Life Flight program recently bought two new EC-145 helicopters at a price of between $8 million and $10 million, partly so they could handle patients up to 650 pounds. “For pretty much everybody in the state, there have been situations where the patient has been too big,” said Barbara Willis, Life Flight’s clinical operations director. 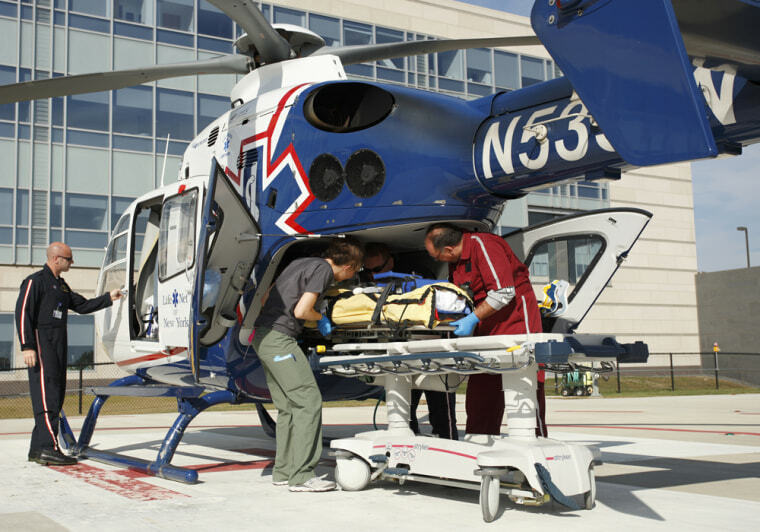 Before they got the new rigs, Duke Life Flight patients were limited to an abdominal girth of 44 inches, she said. “Now we really don’t have to worry,” Willis added. Pilots, too, have to weigh the risks of plus-size patients, balancing the bulk of the victims with the forces needed to get the aircraft off the ground. The lift force that allows planes and helicopters to fly varies depending on air density. Denser air produces greater lift and thinner air decreases lift. Air becomes thinner as temperatures increase and the barometric pressure drops. “If you have a really hot, humid day, we can’t lift nearly as much as on a day when it’s cold and crisp,” Thomson says. So when a patient reported to weigh 250 pounds actually tips the scales at 350, emergency crews have a dilemma. Even if they fly around for 15 minutes and burn off fuel, they may not have enough lift to transport. The solution, of course, requires a societal shift, including recognition that the health effects of obesity extend even beyond heart disease and diabetes to basic access to emergency care. That’s particularly clear to Craig Yale, the 57-year-old Air Methods executive, who recently lost 125 pounds after undergoing gastric-sleeve weight loss surgery. Eighteen months ago, when he weighed 335 pounds, Yale realized he might not fit on his firm’s own aircraft. Today, he’d have no trouble. But Yale said he worries about others who might not realize that so much extra weight could threaten their lives, not just with disease, but with delays in an emergency. “I would encourage anybody to do what they can to be healthy,” he said.